How to make aInvestment Calculator in Excel? An easy way to create your spreadsheet is by downloading this example Investment Calculator Excel spreadsheet template now! 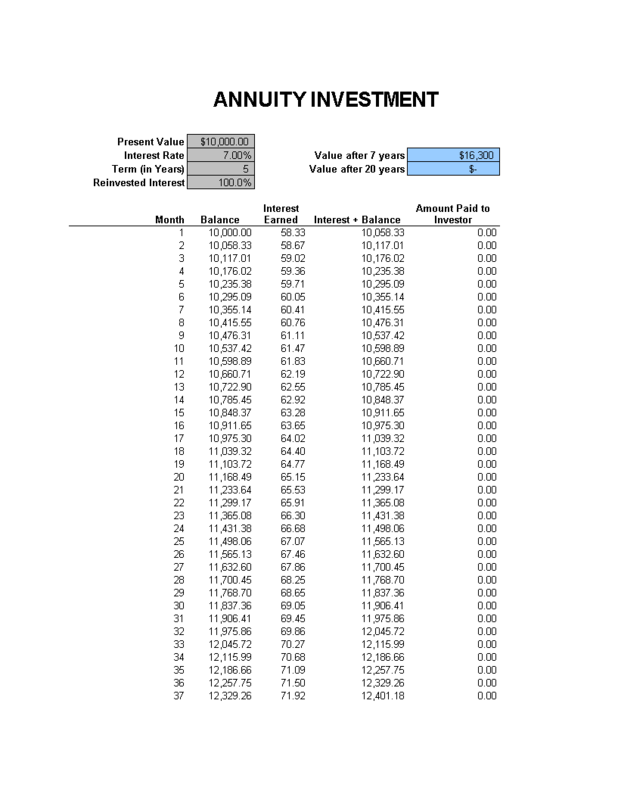 The Annuity Calculator is intended for use involving the accumulation phase of an annuity and shows growth based on regular deposits. An annuity is an investment that provides a series of payments in exchange for an initial lump sum. The payment that would deplete the fund in a given number of years. The amount needed to generate a specific payment. The number of years your investment will generate payments at your specified return. Annuities can be used as a regulated stream of income, which can make it easier for a person to manage their assets in a way that ensures that those assets last for the duration of their lifetime. For instance, a heavy spender who suddenly receives a large inheritance can use an annuity to reduce the risk of overspending and depleting their assets. Download this Investment Calculator Excel spreadsheet now!